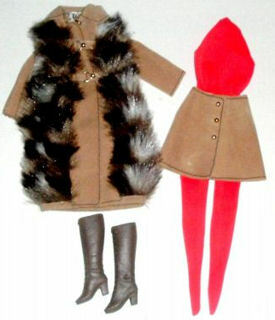 This ensemble came in two different fur variations - one with the dark brown and white furs as pictured and one with solid dark brown fur. The back of the coat is solid fur. 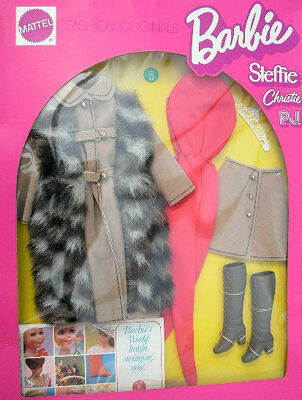 The coat and wrap style skirt are made out of the same brown faux-suede. They both have gold bead button closures. The red tricot "cat suit" provides the backdrop for this fun mod ensemble. The brown knee high "lace up" boots complete the ensemble.